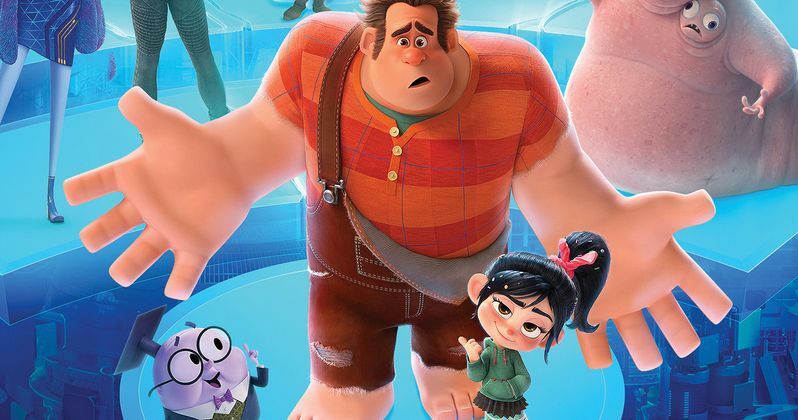 In the hilarious, highspeed sequel to 2012's Oscar-nominated Wreck-It Ralph, the besties risk it all by traveling to the expansive, fast-paced world of the internet in an action-packed attempt to save Vanellope's game Sugar Rush. Ralph Breaks the Internet is available instantly on Digital 4K Ultra HD™/HD/SD and Movies Anywhere Feb. 12 and physically on Blu-ray and DVD Feb. 26. Ralph Breaks the Internet arrives home with a wide-range of exclusive extras, taking fans behind the scenes at Walt Disney Animation Studios to explore how artists created the film's vibrant version of the internet, from comical cat videos to the intense online game Slaughter Race to shady characters on the Dark Net. Features also reveal some Easter eggs, inside jokes and references to other Disney films and characters hidden throughout the film, and filmmakers introduce some never before revealed deleted scenes. Directed by Rich Moore (Academy Award-winning Zootopia, Wreck-It Ralph) and Phil Johnston (co-writer Wreck-It Ralph, Zootopia writer, Cedar Rapids), and produced by Clark Spencer (Zootopia, Wreck-It Ralph, Bolt, Lilo & Stitch), Ralph Breaks the Internet welcomes back favorite cast and characters introduced six years ago, including Reilly, who provides the voice of Ralph, and Silverman, who returns as the voice of Vanellope. Lending a virtual hand to Ralph and Vanellope is Shank, voiced by Gal Gadot, a tough-as-nails driver from a gritty online auto-racing game called Slaughter Race, a place Vanellope wholeheartedly embraces, so much so that Ralph worries he may lose the only friend he's ever had. Yesss, voiced by Taraji P. Henson, the head algorithm and the heart and soul of the trend-making site BuzzzTube, makes Ralph a viral sensation. Jack McBrayer and Jane Lynch return as the voices of Fix-It Felix Jr. and Sergeant Calhoun, respectively, and Disney Animation's good luck charm, actor Alan Tudyk was called on to voice a search engine named KnowsMore, literally a know-it-all , who runs a search bar and helps Ralph and Vanellope on their quest. Lots of exciting cameos are also featured in the film including a scene that reunites all of the original (living) Disney Princess voice cast. Bonus features for the Blu-ray and Digital release include 'How We Broke the Internet': Go behind the scenes at Walt Disney Animation Studios to get an in-depth look at how the filmmakers brought a world to life that billions of people visit every day but never actually see - the internet. Take a front-row seat as the team reveals the inspirations for the story and what it took to bring it to the screen. Discover all that went into developing the characters of the film including netizens like KnowsMore as well as characters like Double Dan. See the lengths the team took to create the car chase scenes in Slaughter Race and much, much more. Deleted Scenes: Five deleted scenes with intros from directors Rich Moore and Phil Johnston. Scenes include Into the Internet, Opposites, Domestic Hell, Bubble of One & Recruiting "Grandma." BuzzzTube Cats: Many videos were created by the animators to fill the screens of the Internet world...and lots of them are of cats! Check out the BuzzzTube to watch this hilarious cat compilation. Music Videos: "Zero" by Imagine Dragons and "In This Place" by Julia Michaels. This big big 4K, Blu-ray and DVD announcement comes direct from Disney Movies.